This week I want to highlight Prosthecobacter fusiformis and related species from the genus Prosthecobacter. P. fusiformis is an interesting organism; however I must admit that I discovered it randomly by picking a taxon found in every sample (eight sites total) in one of my datasets. Yes I realize that many may regard this as an odd way to pick a bacterium to write about, but I feel that this was an appropriate way to discover an organism which I knew very little about. So where does this organism get its name? Prosthecobacter refers to the terminal prosthecae found on all of the cells. Prosthecae are a cellular appendage which includes a holdfast that is used to attach to surfaces. Due to the presence of the prosthecae these organisms were originally placed with the Caulobacter (alpha proteobacteria) which are the best known group of prosthecate bacteria. 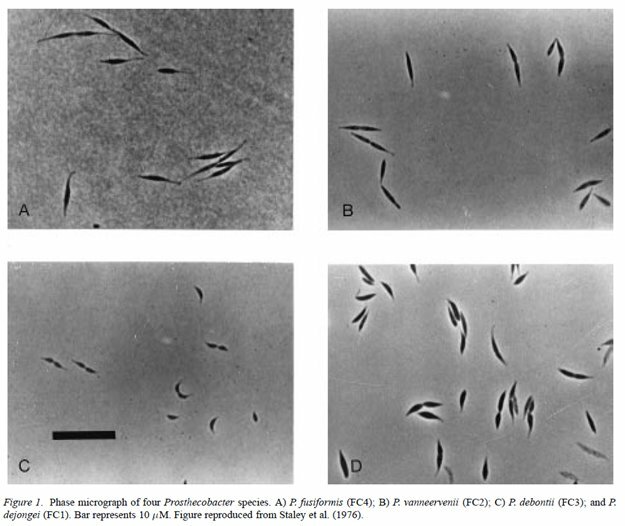 However, it was later discovered that Prosthecobacter do not divide asymmetrically to produce motile (with no prosthecae) and non-motile (with prosthecae) cells. Instead they divide laterally, and thus all daughter cells have prosthecae and remain non-motile. Due to this type of division, Prosthecobacter produce clumps of cells that radiate out along the attached surface. I’m sure that if we were able to image, without disruption, surfaces containing this organism we would be able to find intricate patterns on surfaces. I wonder what the patterns of mustache bacteria would look like? Ok, so maybe I didn’t only highlight P. fusiformis. Obviously I am more interested in P. dojongei but you still get the point. The genus Prosthecobacter is a great example of the extreme diversity and beauty of aquatic microbes and microbes in general. I still only knew little about this group of organisms, but I find them highly fascinating and I hope you now do as well. Questions, Comments: All welcome!!!!! new species of Prosthecobacter. Antonie van Leeuwenhoek 72: 29–38.